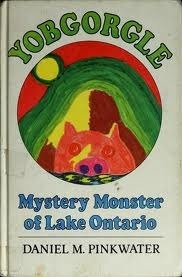 Yobgorgle is the mysterious monster that lives in Lake Ontario, in the fun 1979 children's novel (of the same name) by the amazing Daniel Pinkwater. The book contains many Rochester and Upstate New York references, both real and imaginary (including the secret room in the Rundel Memorial Library Building in the old children's room and the Guggenheim-like parking garage in downtown Rochester). The book is out of print as a separate volume, but it is available in 4 Fantastic Novels, a compilation of four novels by Pinkwater. Older editions can often be found at bookfinder.com. Also, has a great description of Midtown Plaza and the Clock of the Nations that used to reside there!